iOS 7 performs differently based on the model of the device. Some features that would be available on iPhone 5s won’t be accessible for iPhone 5 users. Similarly for even older devices such as iPhone 4 a lot of features are not available and that includes dynamic blur, which appears on different parts of the operating system such as Control Center, keyboard etc on newer iPhones, iPads and iPod touch. A new tweak called BlurEnabler brings this missing feature to iPhone 4. With this hack the dynamic blur is activated on all parts of the operating system just like on any other device. According to tweak’s description it causes no or very little lag to the device’s performance. The developer also plans to add a blacklist to the tweak that will allow users to add apps that are causing too much lag, enabling them to disable dynamic blur in those applications. This tweak is fully compatible with Fancy and Uniformity tweaks as well in case you are using them. As reported by reddit user /u/Azcion the tweak also works on the iPad enabling dynamic blur feature on it as well although the developer has not tested on the iPad yet and the tweak is only meant for iPhone 4 officially. 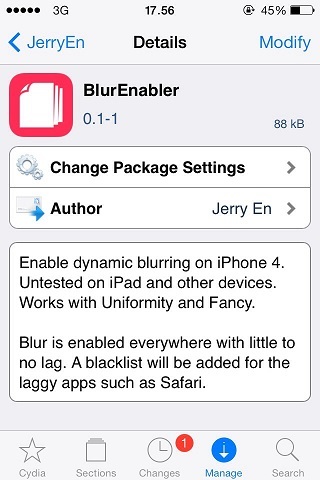 BlurEnabler tweak is available in Cydia for free. You can add “cydia.jerryen.com” to your sources in order to get it.